Manufacturer of a wide range of products which include c type power press, h type hydraulic press, h-type power press and c type power press 100ton. Precisely engineered C Type Power Press is effectively configured on the basis of latest technological processes. Our optimally functional c type power press is accessible in various dimensions. It is commonly used as paper conversion machines. 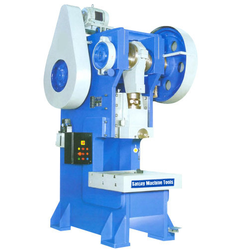 We also provide this particular press as per the specifications laid by our clients. We fabricate & supply a wide gamut of H Type Hydraulic Press that are comprehensively used in several mechanical operations like bending, forming, press fitting, straightening and many more. 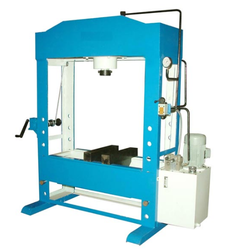 The H-Type Power Press or pillar tire press are fabricated from the high-grade raw material for assuring their superior quality & accuracy in their operation. 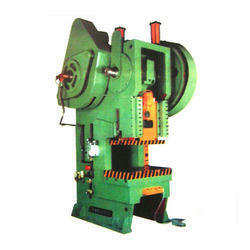 Piller type power press aids in accomplishing unperturbed production and operation activities. The machines have potent brakes and these functions on the top dead centers and compensated springs. The clutches & other accessories are better installed & extremely rigid, which protects it from any type of tamper/ damage. 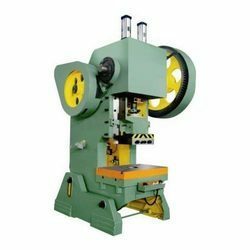 We offer a wide range of Power Press Machine that is manufactured using the premium material for ensuring their superior quality and accuracy in their performance.